Aston Villa manager Paul Lambert is planning on holding talks with captain Ron Vlaar in a bid to resolve the defender's future. 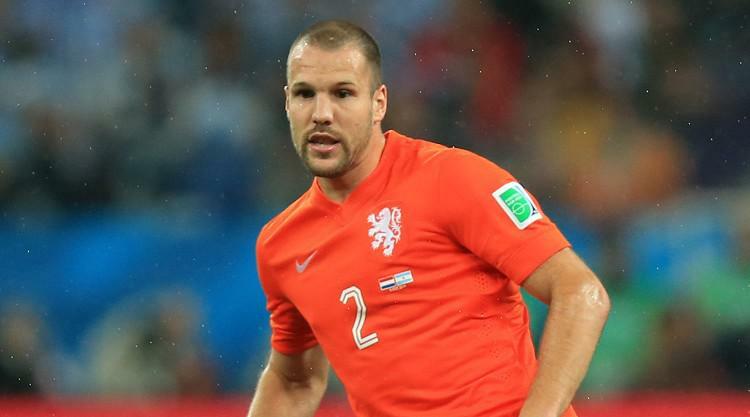 With one year remaining on the Dutchman's contract, and following his stand-out performances for Holland in the World Cup, Vlaar has since been linked with a number of clubs, notably Serie A pair Juventus and Lazio. After an extended break for the 29-year-old in light of his World Cup exertions, Vlaar returned to the Villa fold on Saturday, although as a spectator only for the club's 4-1 pre-season friendly defeat at Groningen. With Vlaar back in training this week as the countdown continues towards the opening Barclays Premier League game with Stoke on August 16, Lambert said: "He told me he is concentrating on that game. "He's not had much of a break, but he's enthusiastic, positive and raring to go." Once Vlaar is back in the swing of things again, Lambert plans on a more in-depth chat. "It was a good feeling I got from him," added Lambert, speaking to the Birmingham Mail. "To be fair, it was a really brief conversation I had before the game as I was preparing the lads for the match. "Ron's got another year still to go on his contract, it's not as if he's at the end of it. "Once we get back I'll sit with him, we'll have a bit more time, but he loves it at Villa, that's well known." One player who is on his way out of Villa Park is Antonio Luna, who has moved to Hellas Verona on loan with the Serie A side having an option to buy the full-back at the end of the deal. The 23-year-old Spaniard moved to the midlands club from Sevilla last July and was a regular in the side up until Christmas. However, he did not play again after a substitute appearance in the 2-2 draw at Liverpool on January 18 this year as on-loan defender Ryan Bertrand took his place. And it appears Lambert does not regard Luna among his first-team plans for the forthcoming season, with Verona announcing they had snapped up the defender on their official website.